All natural fungicide for your lawn and garden. Garlic GP Lawn & Turf* is an all-natural, chemical-free fungicide that controls brown patch and dollar spot. It’s safe for children, pets, birds, wildlife and beneficial insects, as well as yard-friendly creatures such as earthworms. 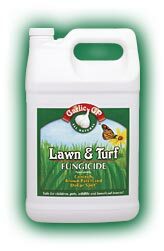 Garlic GP Lawn & Turf - a safe and healthy alternative to chemicals - saves on grass replacement and is very economical, covering up to 2,500 square feet. It works for up to 21 days after application and becomes odorless in hours. Bermuda, Bent, Bahia, Carpet, Centipede, Dichondra, Fescue, Natives, Rye, St Augustine, Zoysia. Avoid eye contact! Flush eyes with water should contact occur. This natural fungicide concentrate also works with the RID System. This bottle plugs into your irrigation system and the contents are mixed with water before being distributed by your lawn sprinklers. Since this natural fungicide works through your sprinklers, it evenly treats your whole yard with minimal effort. You don't have to tote around a heavy jug or strain to reach every spot.